Embroidered Cushions - Covers that add color- or simply - cushion covers that are carefully hand embroidered with colorful thread work and mirrors, and add warmth and glow to any interior. The patterns vary from floral to geometric with vibrant or muted color combinations. Usually made on cotton fabric dyed to match the colors to be used to give a solid base. The entire piece of cloth is covered with motifs with borders and inner designs. Mirrors are added to give more vibrancy and style. Cushions give the rooms colour and easy makeover. These are available in pure cotton with coloured silk embroidery with mirrors. Made by women artisans that are experts in these designs and styles work mostly from home as cottage-industry. These are handicraft specialty of Pakistan mainly form Sindh region. 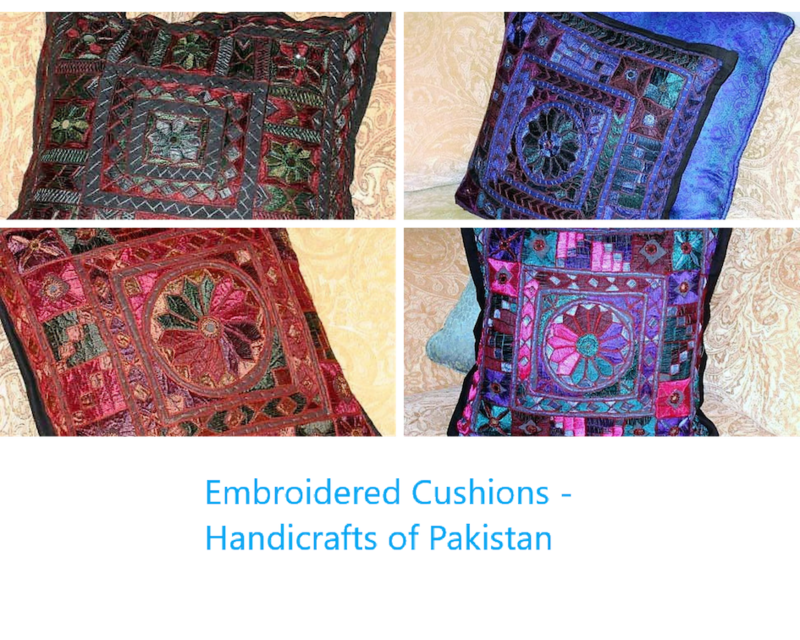 Usually in pairs - one can get one piece also - with one side fully embroidered, cushion covers. These serve as exquisite gifts when visiting other countries. Foreigners traveling through Pakistan usually buy a lot of these cushion covers to give away as gifts back home as these do not take up too much space in the luggage. For anyone wanting simple yet colorful additions in a room - these cushion covers do the trick. They make lovely gifts and give-aways for all occasions- be it a birthday, house warming or Christmas - without making a big hole in the wallet!